Here it is, the Red One 4K camcorder, tucked away in its crimson booth at NAB. 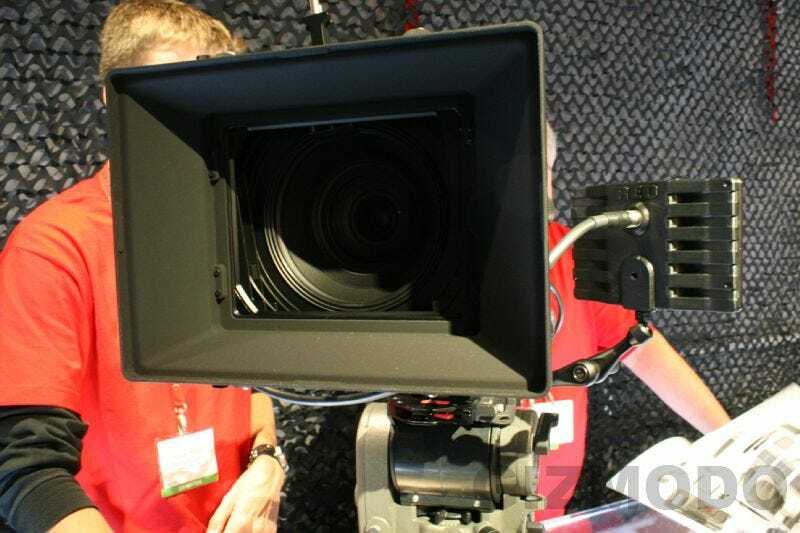 In addition to showing the camcorder, the company also announced a smaller camcorder it will call "Mini Red" shipping at an unspecified date, a line of 4K projectors, and a not-quite-complete digital cinema camera that's still in Beta, yet "nearly ready." More details later—take a gander at these pics, hot from the show floor. Getting our hands on the camera, we noticed it's not as heavy as we thought it would be due to the carbon fiber construction of its rail mounting system. It's small, about the size of a normal prosumer video camera with a fixed lens. Hang a lens up front on the Red One, and it's a bit bigger, but still surprisingly small. The grips were quite knarly, like off-road tires or hand grips on a BMX bike. It's extremely configurable. Speaking of lenses, Red will offer a 5-lens prime kit for $19,975 available in Fall 2007, consisting of 15mm, 25mm, 35mm, 50mm and 85mm lenses, and all have an f/1.9 aperture except for that 15mm lens, which will be f/2.8. There will also be an $6500 18mm - 50mm f/2.8, available this summer, according to Red. Finally, there's an f/2.8 300mm for $4950. There's more. Don't miss our visual evaluation of the camera's output, and an interview with Red's Ted Schilowitz.